At home in the ice-covered Arctic, Polar Bears are the world's largest land carnivore. They feed mostly on seals, can swim up to 60 miles without a break and can sniff out prey up to 10 miles away. 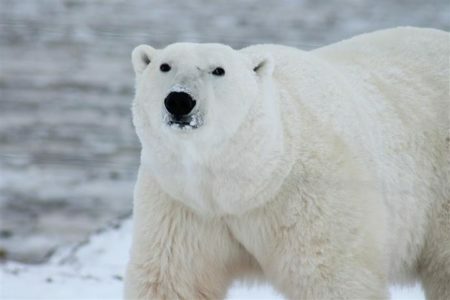 At up to 2.5 m in size, Polar Bears are not only the largest bear but also the world’s biggest land carnivore. They are fascinating creatures that have evolved to survive in some of the harshest and coldest environments on earth. Polar Bears are at home in the Arctic, living in parts of Canada, Alaska, Greenland, Russia and Norway. 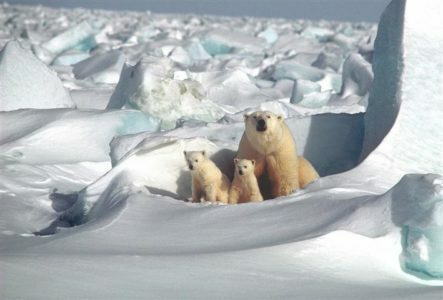 Though born on land, they spend most of their time at sea and hunt only from sea ice. Polar Bears are usually carnivorous, although they are known to feast on other food sources when prey is scarce. Seals make up the majority of their diet, but they also consume carcasses, such as those of dead whales. How do Polar bears hunt their prey? Polar Bears are excellent swimmers. They can swim for more than 60 miles without having a break, yet they rarely hunt at sea. Instead, they use the ice as a platform and wait patiently for seals to pop up at breathing holes or ice edges. Polar bears live in one of the planet’s coldest environments and depend on a thick coat of insulated fur and a layer of insulating fat to keep warm. They even grow fur on the bottom of their paws, which not only protects them against the cold ground but also helps them grip on the ice. Their skin also has a key role to play in keeping them warm as its unusual black colour means it absorbs heat from the sun. Where do Polar Bears give birth? Female Polar Bears give birth during the winter months in snow dens dug out from deep snow drifts. The dens provide protection from hungry predators and insulation from the harsh cold winter. How long do cubs stay with their mothers? Young Polar Bear cubs live with their mothers for around 28 months to learn survival skills. Females aggressively protect their young but receive no help from their solitary male mates. In fact, hungry male Polar Bears are a threat to young Polar Bears and will kill them. 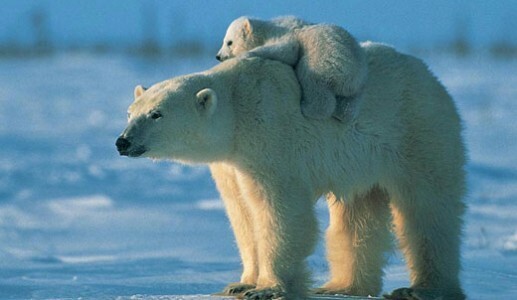 Polar Bears live a solitary lifestyle, with only mother and cubs staying together for any length of time. Polar Bears are powerful predators that often do not fear humans, which can make them dangerous, especially since the sea ice is disappearing and prey is scarce and hard to catch. Near human settlements, they can acquire a taste for garbage, which brings them and humans into dangerous proximity. Do people hunt Polar bears? Yes, they do. For thousands of years, Polar Bears have been a key figure in the material, spiritual, and cultural life of Arctic indigenous people. What is the biggest threat to Polar bears? Polar Bears have no natural enemies; humans are their biggest threat. 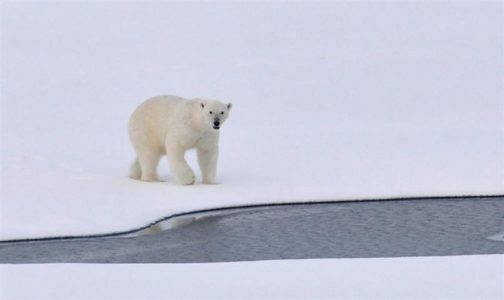 They are classified as vulnerable in the IUCN Red List of Threatened Species, with 8 of the 19 Polar Bear subpopulations known to be in decline. Though following the introduction of controls and quotas, some populations are recovering. The International Union for the Conservation of Nature (IUCN) now lists global warming as the most significant threat to the Polar Bear, primarily because the melting of its sea ice habitat reduces its ability to find sufficient food – read more about Arctic Sea Ice in our Arctic Sea Ice Day blog.